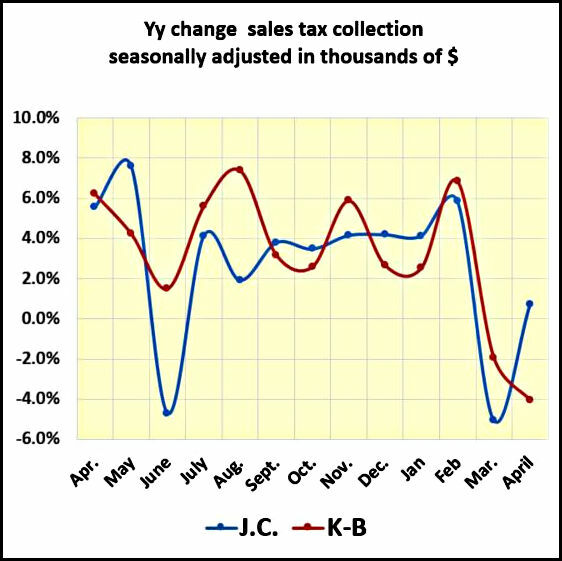 Northeast Tennessee’s April retail sales tax collections rebounded from March’s funk everywhere except Kingsport-Bristol Metropolitan Statistical Area (MSA). Kingsport-Bristol had the dubious distinction of having the lowest year-over-year change in the state – down 4% from April 2016. That came on the heels of March’s 1.9% drop. The region’s other metro areas saw collections increases in the 6% range from April while Kingsport-Bristol saw a month-over-month change of down 0.5%. Here’s how seasonally adjusted collections as reported by MTSU looked compared to April last year followed by the month-over-month change. Morristown – up 1.8%, up 6.4% from March. Johnson City – up 0.7%, up 6.1% from March. Knoxville – up 0.3%, up 6.7% from March. Kingsport-Bristol – down 4%, down 0.5% from March. Trend lines for Tri-Cities collections show April is a downer even with the positive change in the three-county Johnson City. The seven-county Tri-Cities region enjoyed eight months of relatively stable year-over-year gains until the wheel came off that wagon in March. Local sales tax collections are a contradiction to consumer spending nationwide in April. Fueled by rising incomes and tax refunds spending grew at the fastest clip since the end of 2016. Spending was up 0.4%, according to government reports. Local economic reports are all over the place for the first quarter. Unemployment rates dropped to new lows in April, and the economy continued adding jobs. It’s growing, but the rate of growth turned down in April after a three-month uptick. The context to the labor market’s current gains is there are close to 2,000 fewer people with jobs than before the recession, the labor force has declined by 22,666 people, and there are 1,700 fewer non-farm jobs than before the recession. This could very likely be the benchmark for the region’s economic reset from the Great Recession. Private sector wage reports show a bifurcated region with average wages in the Johnson City MSA increasing and Kingsport-Bristol continuing a downtrend. Private sector wages in the Tri-Cities continue to be among the lowest in the state. The third local economic indicator – housing – is the bright spot. Its performance continues to lead the other local indicators with brisk existing home sales and improving prices.